Writer Emily V. Gordon and Kumail Nanjiani on the set of The Big Sick. Photo by Nicole Rivelli. Though it hadn’t seen nationwide release until today, The Big Sick is already all over the news. The film features Kumail Nanjiani, a Pakistani-born stand-up comedian who came up in the comedy world via our own fair city, and the story of how he met his wife, former therapist, now author and producer Emily V Gordon. The film, produced by Judd Apatow and directed by Michael Showalter, is receiving huge accolades, and has been the subject of buzz all the way back to when it was snatched up at Sundance. Indeed, The Big Sick is fantastic in its truthfulness, humor and portrayal of the hardships of immigration, culture clashes and romantic relationships. 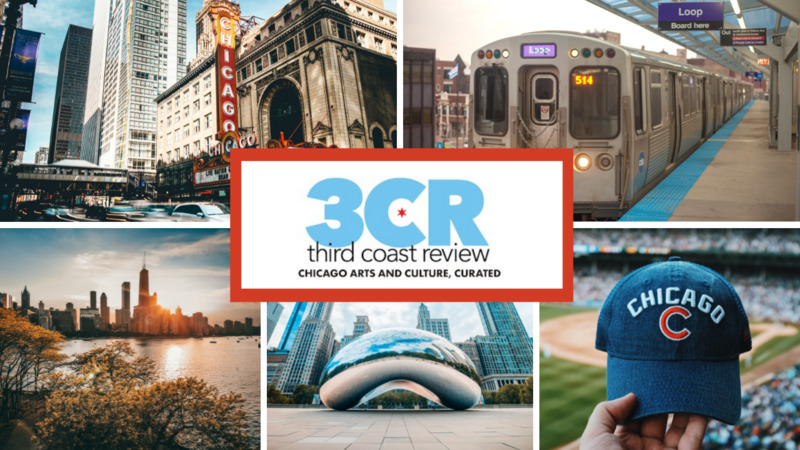 It resonates, perhaps because of its intimacy and truthfulness, and here at Third Coast Review, we loved it. What’s been fantastic for me as well though, is having been able to feel like a part of their lives pre-movie… pre-movie idea even. From making my first acquaintance with Kumail’s comedy on the Nerdist podcast’s inaugural “Comedians You Should Know” episode to seeing Kumail right here at UP Comedy Club in 2012 and later becoming a regular listener to The Indoor Kids, a videogame and pop culture podcast that often went even deeper than that, to getting to know Emily as a writer through her articles on Bust, Rookie, Vulture and her Tumblr. I started listening to “The X-Files Files” and cried right along with Kumail when he was offered a part on the new show, and grabbed a copy of Emily’s book “Super You” which showed off her talents as a former therapist, just as soon as it came off the presses. The two have been #RelationshipGoals for me since before I was in a relationship. Both had big dreams that needed support and found themselves in scary situations–for Nanjiani, trying to survive on the comedy scene and make a living, and for Gordon, succeeding in the just-as-challenging in different ways world of freelance writing. Both inherently understand that relationships will always be work, and make sure to communicate when they need to “be the baby” for a moment, and receive extra support from each other. What immediately struck me about Kumail was that he embraced his awkwardness and nerdy nature, and that it was definitely not an act. In seeing The Big Sick, I realized this still rang true for him as an actor. At the core, he always seems to be himself. And, as I learned more about him, I found myself more charmed by his genuine nerdiness, kindness, sensitivity and humor. It was evident, too, that even in a scene that is full of groupies and single folks, he was head-over-heels for his wife. In fact, when Nanjiani embarked on Indoor Kids, a videogame podcast for the Nerdist network, it was only a few episodes in before he invited his wife as a guest. She would soon replace Ali Baker as co-host, and the two would go on to discuss everything from their cat Bagel to the games they’re playing and the movies they catch (together, of course). In an incredibly “aww”-inducing moment of brilliance, Kumail also formed a fan club for his wife, the Eagle-Eyed Spotter’s Club, after feeling like she was unfairly left out of the limelight. I was a charter member of this club, and brought my own shampoo bottle to UP Comedy Club for his 2012 show so she could sign it, as was the strange tradition. Later, I’d find myself discussing America’s Next Top Model with her on Twitter. Both Emily and Kumail have big stories. For Kumail, it’s growing up in Pakistan, being misunderstood as a child there by his less nerdy peers, and then being misunderstood upon entry to the U.S. and the comedy scene. While navigating the Chicago comedy scene, he had to contend with racism, rejection and a commitment to be who he was and not retread the same ground. At the same time, he faced real danger with any talk of his life and his religion. Serious threats were made to him back in 2007 after a popular interview in Chicagoist, which led to him requesting that the interview be taken down so as to protect the people closest to him back in Pakistan. At the time, the publication, and likely, Nanjiani, pondered whether or not his Muslim heritage was to be shied away from in his comedy or not, as it carried very real risks. We’re glad to see him safely emerge from that and be able to fully tell his story in his act and for the film these days, though even recently he admits to increased xenophobia infiltrating his family’s generally happy experiences in the U.S.
For Emily, who’s from North Carolina, it’s more a story about not wanting to be vulnerable, not feeling good enough, and not caring about herself the way that she’d later come to learn she needed to. What put an extra layer into the movie for me was having read her Tumblr and having read her beautiful essay for Lenny’s letters, which bring to light the issues so many women, including myself, face about who and what they are versus what they should be. Like her, I felt and sometimes still feel that I need to put up walls, but unlike her, I didn’t present one of my most vulnerable moments, both relationship-wise and healthwise, for the world to judge. It’s a ballsy move for anyone, and that’s one of the things I admire so much about Gordon. She manages to be honest without brutality and vulnerable without defensiveness, and it makes her incredibly approachable, and much loved in the circles she runs in–even becoming something of a den mother in the LA comedy scene, adored by the likes of Pete Holmes and Marc Maron simultaneously. She left a career in therapy for the life of a freelancer, found love, got sick and only three months later, found herself having three weddings to the same man (one in NC, one at city hall in Chicago, and one in Pakistan with a particularly awful officiant) and moving to New York. What could have been a disaster turned into a great movie, of course, but even more than that, a great relationship. In a world that overshares on the daily, it’s easy to forget what tender parts these two are offering up to their audience –-this film represents an incredibly hard, incredibly confusing time for both Nanjiani, as he’s coming to grips with losing his religion and finding love outside of what his parents want for him, and most certainly and intensely, for Gordon, who’d just been in what was literally a life-or-death situation that she had no control over. And though it may have seemed impulsive, even to them, the decisions they made then stuck in a big way. I know it’s real because I’ve seen it be real for them and the people around them for years now. This is kismet. They’re together for a reason, and the real power of both their marriage and this movie is that of community. Seeing The Big Sick has made me cry for lots of reasons, not the least of which is that the real couple behind the story feel like friends from the moment you make their acquaintance, and it’s always great to root for your friends. If you’ve not seen this film, I suggest you put it on your agenda. The Big Sick opens in theaters nationwide on July 14.